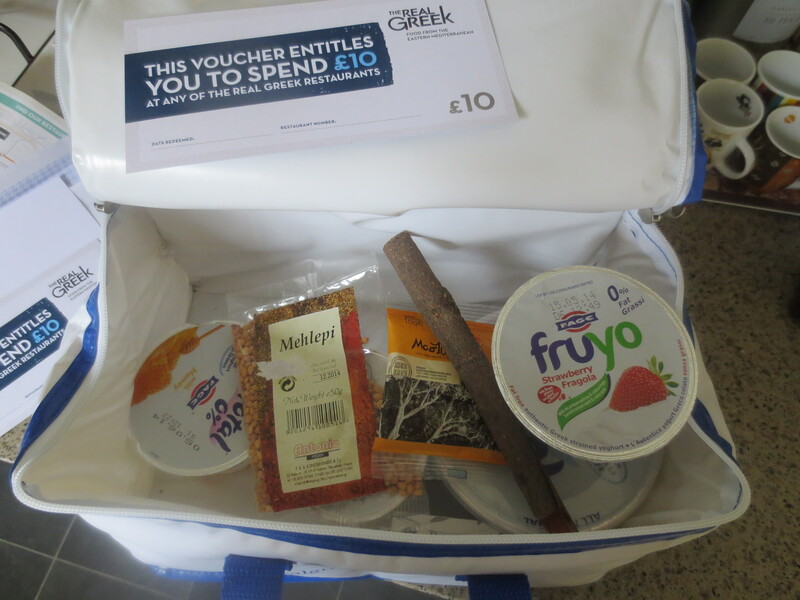 Back in January, the lovely people at Total Greek yoghurt sent me a large amount of their wonderful yoghurt with which I had lots of fun coming up with new recipes and revisiting old (click here and here). 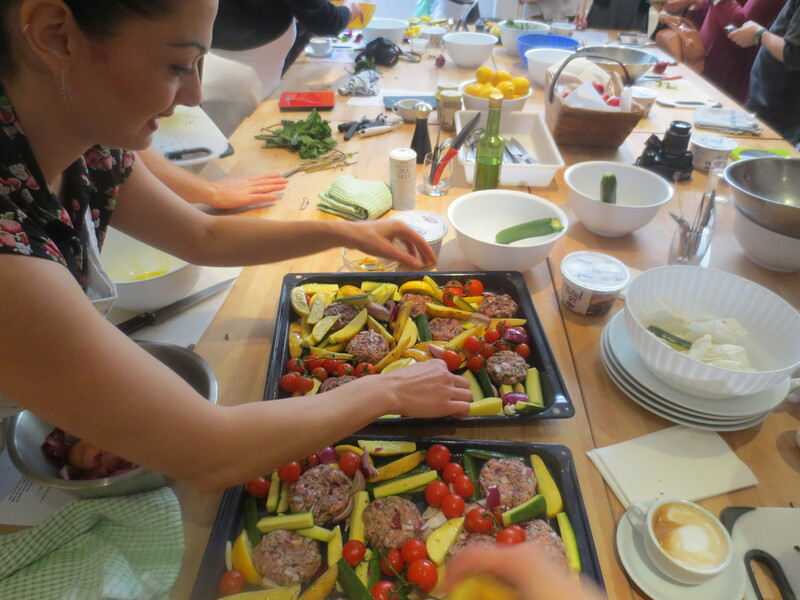 Then last week I received an email asking if I’d like to attend a masterclass they were organising with TV cook, Tonia Buxton, cooking traditional Greek Easter dishes. So keen was I to go, I juggled some things round to make myself free, and in the midst of my email conversation with them they kindly invited my son too who, already on holiday this week, was delighted with the invitation. I’ve said before on these pages that if you are cooking or preparing food that calls for Greek yoghurt, then there really is only one kind you should buy: Total. And I’d like to add that I said that many times before Total sent me a gift of yoghurt or invited me on the course today! Supermarket shelves are full of ‘Greek-style yoghurt’ and it really isn’t the same thing at all. Total’s thick creamy yoghurt is made in Athens and shipped to the UK. It contains only two things: milk and yoghurt cultures. If you look at the labels of Greek-style yoghurts you will usually see many other ingredients: stabilisers, thickeners and sometimes even cream to achieve the creamy consistency. A simple tasting of the real thing alongside the imposter will immediately show you what’s by far the better choice. I nearly always have a pot of Total in my fridge; I love it with just fresh fruit and some honey. But it’s also essential to use the real thing is you’re making dishes like taziki. 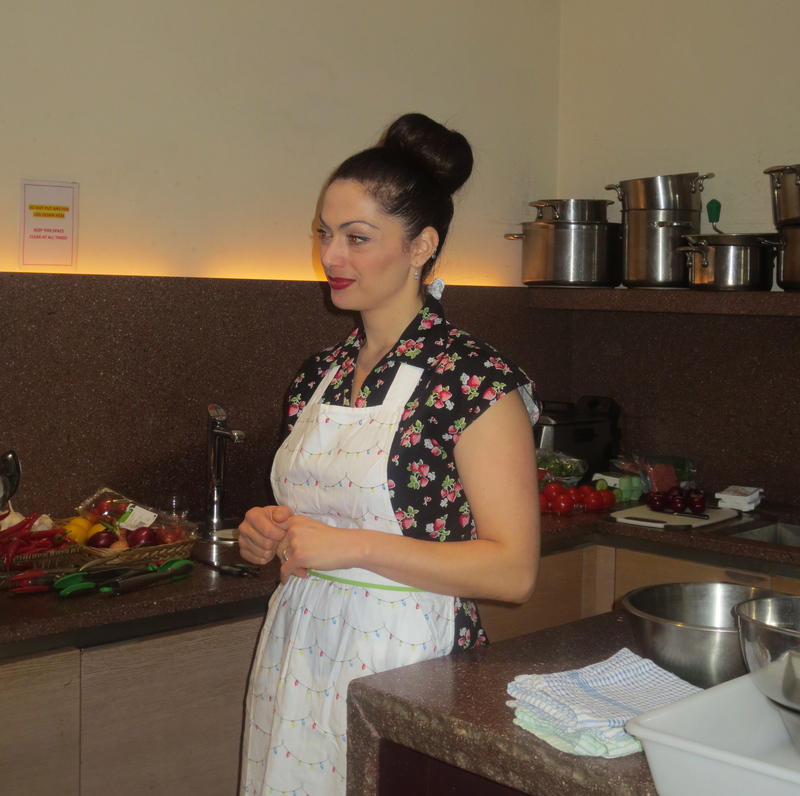 Tonia Buxton is a Greek Cypriot and presenter of the award-winning TV series on Discovery Channel, ‘My Greek Kitchen’. She’s also the author of Tonia’s Greek Kitchen and will be in Paul Hollywood’s new series, ‘Paul’s Family Feast’. She’s a wonderfully friendly and enthusiastic tutor and made the day fun as well as informative. She gave us lots of stories and history behind the dishes and ingredients we were using but balanced this with encouraging us to add things as we liked, to our own taste. 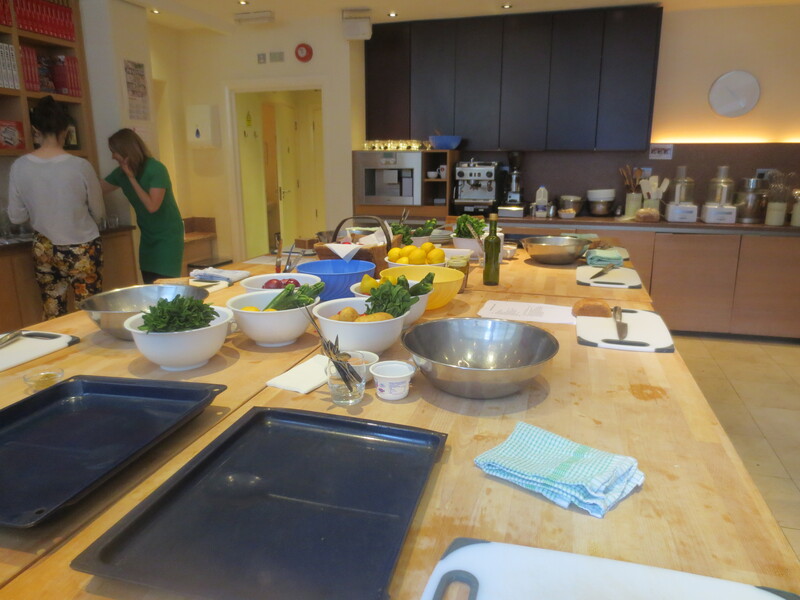 The class was held at La Cucina Caldesi in Marylebone (Giancarlo Caldesi even popped in a couple of times to say hello to us and taste the food at the end). It was a nice bright room to cook in and everything had been laid out ready for us. 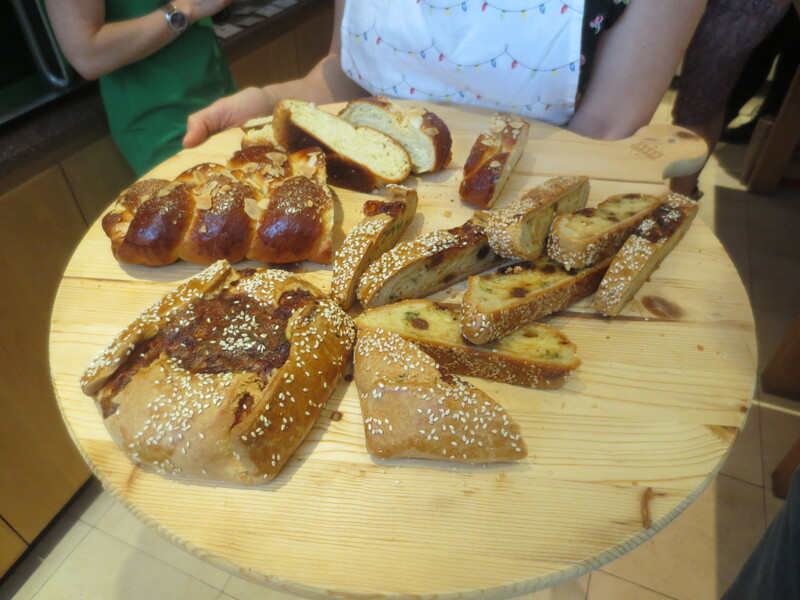 But first of all we spent some time getting to know each other while gorgeous espressos or cappuccinos were made for us by the Caldesi people and Tonia brought round a plate of delicious breads for us to try. Then we got down to some serious cooking; well, not too serious. Just fun and nice. 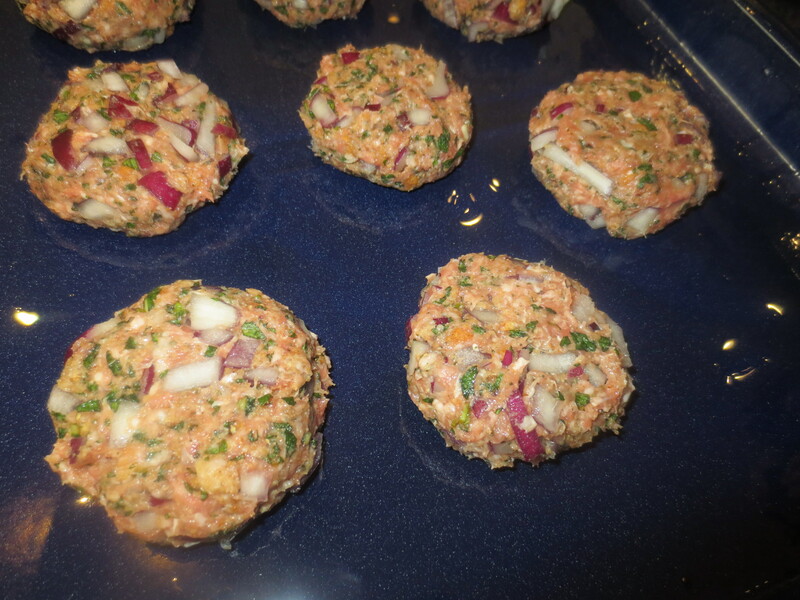 The first thing we made were some lamb patties where minced lamb was mixed with red onion, breadcrumbs, egg, ground cumin and lots of fresh mint. We were working in fours (though our other couple came a bit later, so this one we did as a two). While Jonathan got the patties mixed, I was cutting up new potatoes, wedges of red onion, courgettes and lemons to be coated in olive oil and put round the patties. It was going to be a one-tray bake – and our lunch! Tonia was moving round and talking to everyone, helping them, and helped us put our tray together ready for the oven. It was to be baked a little later, nearer the time we would eat. And when it came out of the oven, it not only looked wonderful, it smelled and tasted wonderful too. 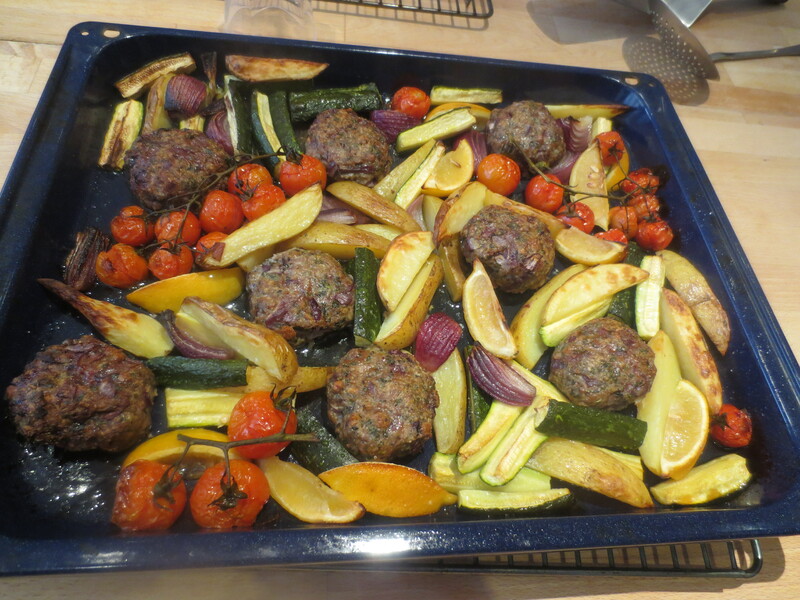 The little patties were light and delicious with a spicy cumin edge; the vegetables were perfectly cooked and I especially liked the slightly charred lemon wedges. We made a tahini dressing to go with it, mixing tahini with lemon juice and Total yoghurt and that was fabulous. The sauce was also served with a fish dish we cooked at the last minute. 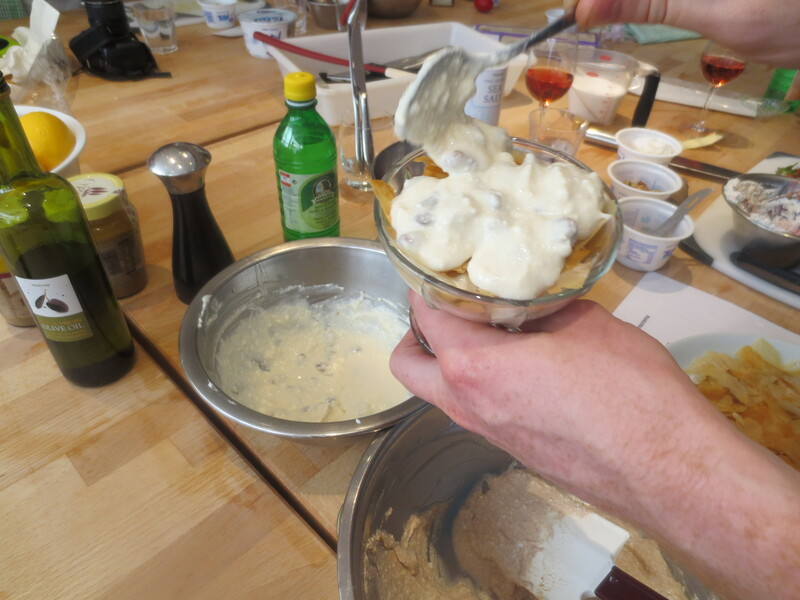 Next we made a dessert which could go into the fridge for a little before we ate. It was Anarocrema. This is a layered dish of baked then crumbled filo pastry sheets and anari cheese (or you could use ricotta) flavoured with rose water, cinnamon, honey and walnuts. We were given some choices of flavourings so we could make three and try each. 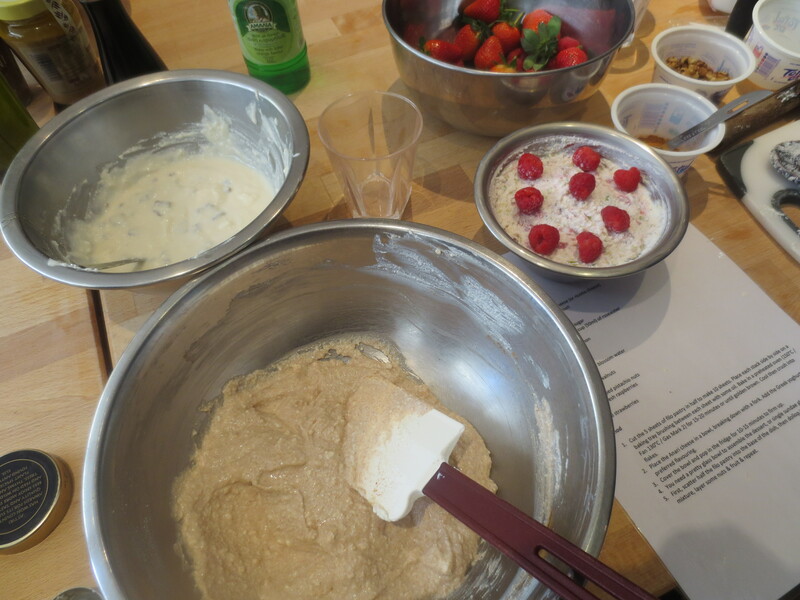 Some we added fresh raspberries or strawberries to; there was orange flower water too and pistachio nuts. We were encouraged to be inventive! 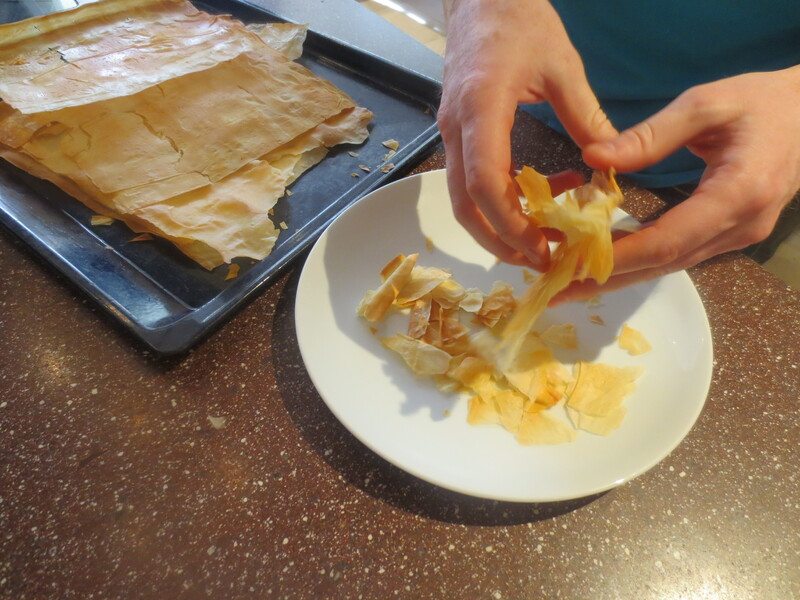 The filo had to be brushed with a little oil between five layers then cooked, cooled and crushed into smallish pieces and then layered between the creamy cheese mix. 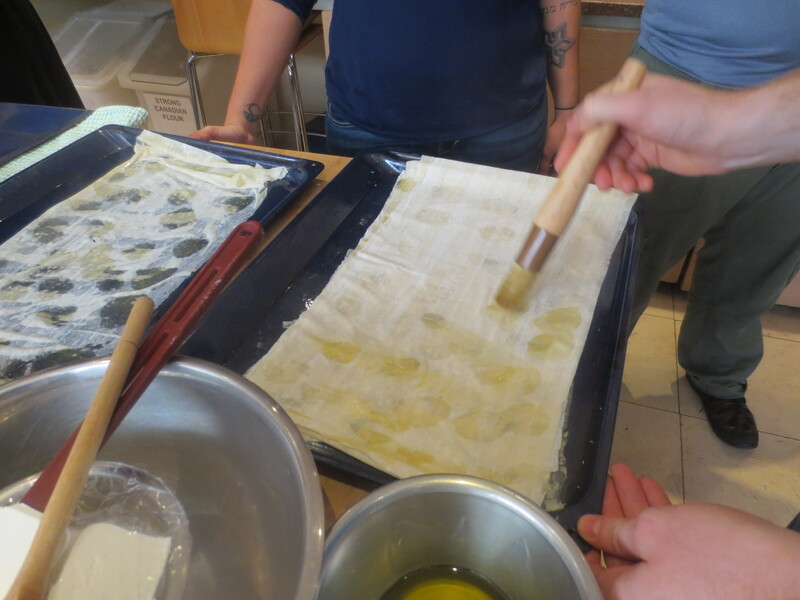 In between some of this cooking we stopped to play a Greek Easter game with eggs hard boiled and dyed red. It was a bit like an English game of conkers: you challenged others to bash your egg against theirs in a special way and the person with the undamaged – or least damaged – egg at the end was the winner. I think the fact that Tonia won had something to do with a childhood of practice and thus a good technique! But none of us minded that, we just had a good laugh. 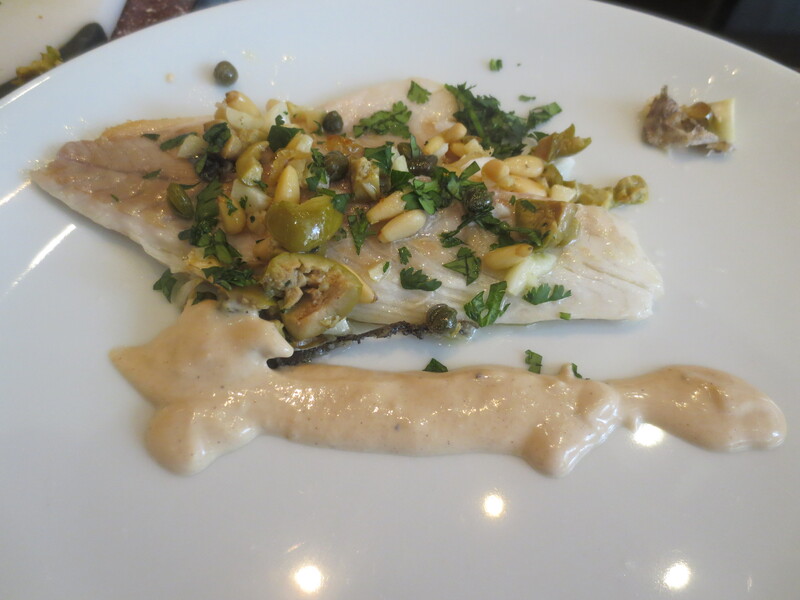 The last dish was the fish; to be cooked and eaten straight away: Sea Bream with Olives, Capers, Lemon & Yoghurt Tahini Sauce. 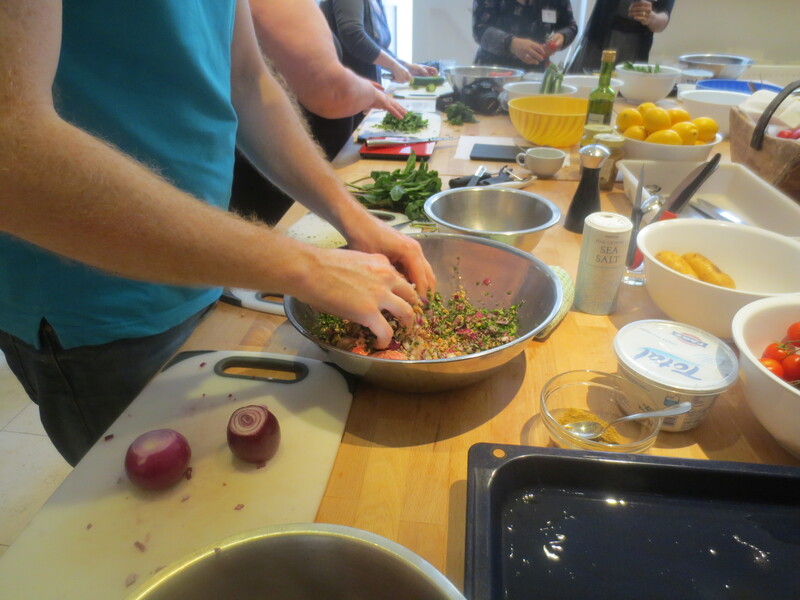 This is when we made the tahini sauce that we also ate with the lamb dish. Meanwhile, someone else was assembling chopped garlic, chopped green olives, capers, pine nuts and chopped fresh coriander ready to go into the pan as the fish was cooked. I meanwhile was assigned the job of cooking the fish. Jonathan, who doesn’t eat fish, was given halloumi cheese to pan-fry. When we were ready to go, the pan was heated, the fish lightly seasoned and added to the hot pan and it was only a matter of a few minutes before the dish was ready to eat. The fish was fried first then transferred to a plate while the olives, garlic, etc were added and cooked a little before being added to the fish as a topping. Some of the tahini sauce was spooned alongside. And it was ready to eat! It was wonderful. Just so delicious. I love sea bream anyway and cook it quite a lot and this is definitely a great way of cooking it that I’ll do again at home. The tahini sauce was a great addition too. The food was served with some very nice Greek wine and we all sat round chatting and relaxing, Tonia moving round talking to everyone. It was also great talking to Emma and Alice from Total and Wendy, Tonia’s assistant in the kitchen. It had been a fabulous day. What a treat! And a really good course; I felt I’d learnt a lot from Tonia without it being heavy at all, just fun. 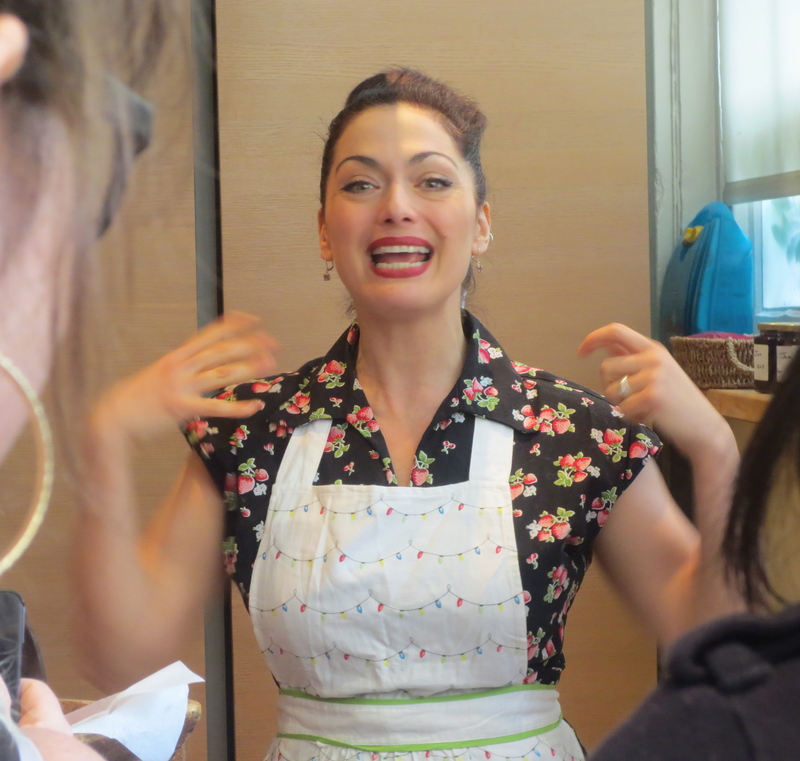 I came away with a copy of her book so watch out for some more Greek cooking (there has been Greek cooking here before, but not for a while) and I hope to now catch up with watching Tonia on her TV programme (for more about Tonia see www.toniabuxton.co.uk). 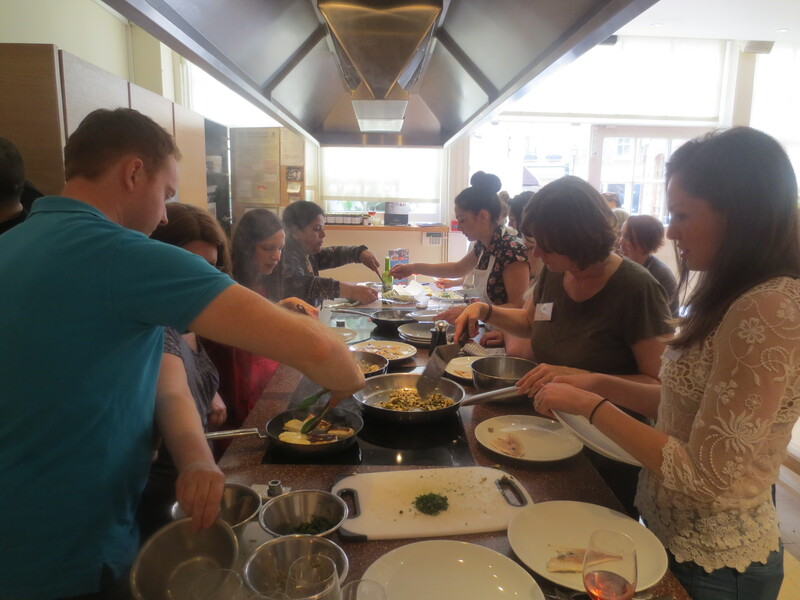 This cooking class looked like A LOT of FUN!